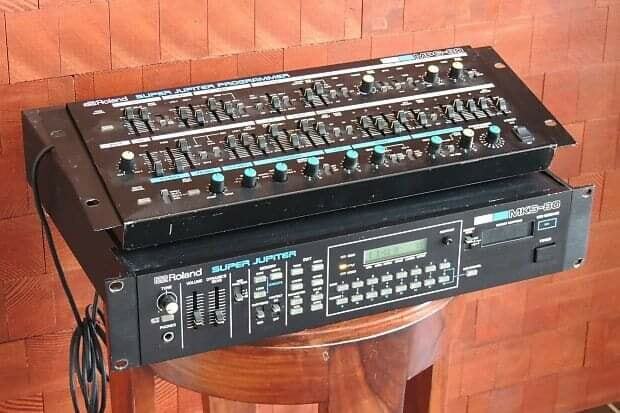 The Roland MKS-80 Super Jupiter is a rack version of Roland Jupiter-8 and Roland Jupiter-6 and an 8-voice polyphonic analog synthesizer that was manufactured by Roland between 1984 and 1987. It is the only of MKS series of synthesizers to have fully analog voltage-controlled oscillators. Contrary to popular belief, the voice architecture is more closely related to the Jupiter-6 synthesizer than the Jupiter-8, the service manual states that "The module board of MKS-80 features the following in addition to that of JP-6, its brother module. ) HPF_ )Low boost circuit in the 2nd VCA. )DC supply current boost circuit." The unit is fully capable of producing most of the Jupiter-8's signature sounds, in addition to many sounds unique to the MKS-80. In February 1985, Roland started producing a new revision of MKS-80, known as "Rev 5", that had no ties with any previous Jupiter's hardware, as it used a new generation of both Roland VCO's, VCA's and filter. The Rev 5 filter was also used in JX-8P, JX-10 and MKS-70 synthesizers. The voice architecture of the MKS-80 is fully analog with 8 polyphonic voices with 2 voltage controlled oscillators (VCO) per voice, using the Curtis CEM3340 VCO integrated circuit. The unit also includes one voltage controlled filter (VCF) and one voltage controlled amplifier (VCA) per voice. The MKS-80 has a 64 patch internal memory (8 banks of 8 patches each) along with an optional memory cartridge called the M-64C with room for another 128 (2 banks of 64 each). A full MIDI implementation is built into the MKS-80, with MIDI IN, OUT and THRU jacks positioned at the rear of the unit. The MPG-80 is the optional programmer designed specifically for the MKS-80, providing direct access to the majority of the MKS-80's features. The MPG-80 connects to the MKS-80 via the Controller port using a special cable. When used with an MPG-80, the MKS-80's MIDI IN port is not used in favor of the MIDI IN on the MPG-80. Madonna - bass in "Into The Groove", "La Isla Bonita", "Open Your Heart", "Who's That Girl"
Oscillators - 16 Oscillators at 2 per voice!